The Moscato wine, made from the Muscat grape, is particularly famous for its gentle flavour of nectarine, orange blossom and peach. Although the wine is often sweet, it’s refreshing flavour profile and low alcohol content means that it is so much more than a simple dessert wine. Vine Vera is proud to announce the launch our latest skin care collection, the Moscato Resveratrol Sensitive Skin Collection, which has been formulated to help recreate the gentle touch of Moscato wine in a skin care collection for people with sensitive skin. Think of sensitive skin like you would think of someone who has a sensitive personality. Since the skin cannot express its disappointment in words, it does so in the form of an itchy rash or red bumps. One out of every five people have sensitive skin, making this a very common skin type. Unfortunately, the number of products that specifically cater to people with sensitive skin are not as numerous as many would want them to be. Women of today are concentrating on more anti-aging solutions than their predecessors, and some of the ingredients that these products contain tend to cause irritation, thereby making things worse. 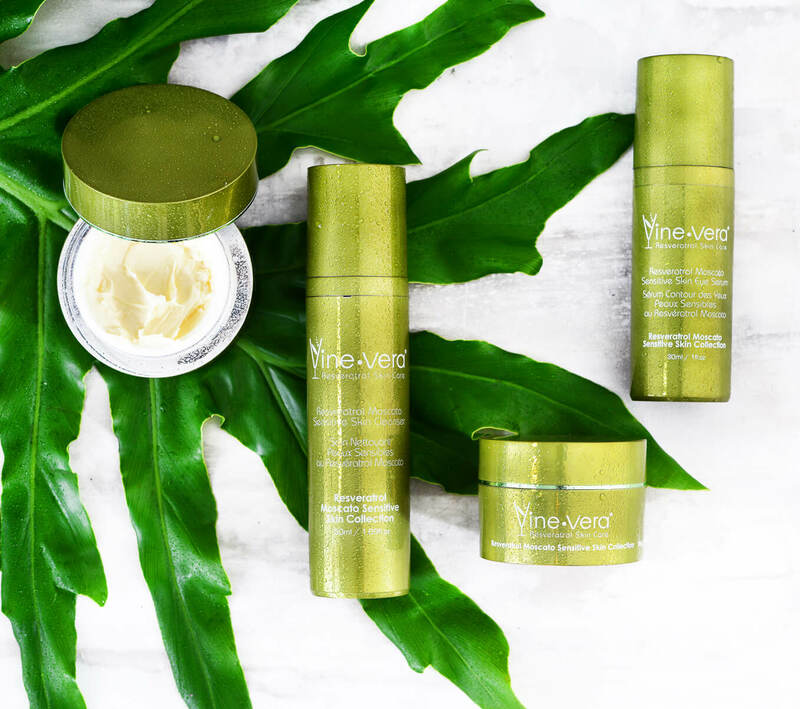 Vine Vera created the Moscato Resveratrol Sensitive Skin Collection to help those with sensitive skin concentrate on anti-aging solutions, without having to bear the ordeal of skin irritation or red spots. The products contained in this collection have been formulated using the gentlest ingredients, antioxidants and nutrients, which deliver the required dose of pampering without upsetting the skin. This means that you never again have to compromise on anti-aging treatments simply because of your sensitive skin. The Moscato Resveratrol Sensitive Skin Collection contains four unique products – the Moscato Resveratrol Sensitive Skin Cleanser, Moscato Resveratrol Sensitive Skin Eye Serum, Moscato Resveratrol Sensitive Skin Eye Cream and the Moscato Resveratrol Sensitive Skin Cream. The Moscato Resveratrol Sensitive Skin Cleanser is a soap-free gel-like cleanser that acts as the first step of your sensitive skin care regimen. It helps you enjoy a refreshed and decongested feeling, and leaves the skin with a looking and feeling clean, without stripping away vital lipids or essential moisture from your skin. Next up is the Moscato Resveratrol Sensitive Skin Eye Serum. The serum helps you take care of an area that usually suffers the most – your eyes. The non-greasy and lightweight formula acts as the perfect foundation for you to build upon and delivers a naturally glowing look within no time. The third product to arm yourself with is the Moscato Resveratrol Sensitive Skin Eye Cream. Since the eye area is usually the first place to show signs of aging, it needs more protection than the rest. This cream delivers that protective edge through its delicate, yet hydrating formula which restores the way your eye area looks and gives it a firmer and plumper appearance. The last product that this collection has to offer is the Moscato Resveratrol Sensitive Skin Cream. This cream helps reduce the appearance of the signs of aging and its ingredients work to assist with reducing the damage that has already been caused to your skin. Adding the cream to your daily skin care regimen can help restore a glowy look and also smooth and soft feeling skin. Each product from the Moscato Resveratrol Sensitive Skin Collection can be used individually as a part of your skin care routine, but using the entire collection together usually offers the best results.